I’m very honored to be invited to contribute to this blog! Thank you Alison! I would like to start by embellishing upon the lovely introductory post that Alison put up for the project. We will start with introducing Tim, my partner in crime on this exploration of the microorganisms of our surrounding wetlands. Dr. Tim McLean received his Ph.D in Genetics and Molecular Biology from the University of North Carolina-Chapel Hill in 2001. He further developed and adapted his molecular expertise to the field of marine ecology during two post-doc experiences, first at the University of Southern California a d the at the Rosenstiel School of Marine and Atmospheric Sciences at the University of Miami. Before assuming his position as Professor of the Practice at Tulane University in 2014, he was an assistant professor at the University of Southern Mississippi. His research interests include using relevant ‘omics-based technologies and bioinformatics to understand the molecular biology and ecology of a marine dinoflagellate that is responsible for forming harmful algal blooms (‘red tides’) in the Gulf of Mexico. Tim McLean with a fresh water sample!!! Our first excursion into the swamps together in the pursuit of phytoplankton! The project itself is funded by a residency program put on by A Studio in the Woods! 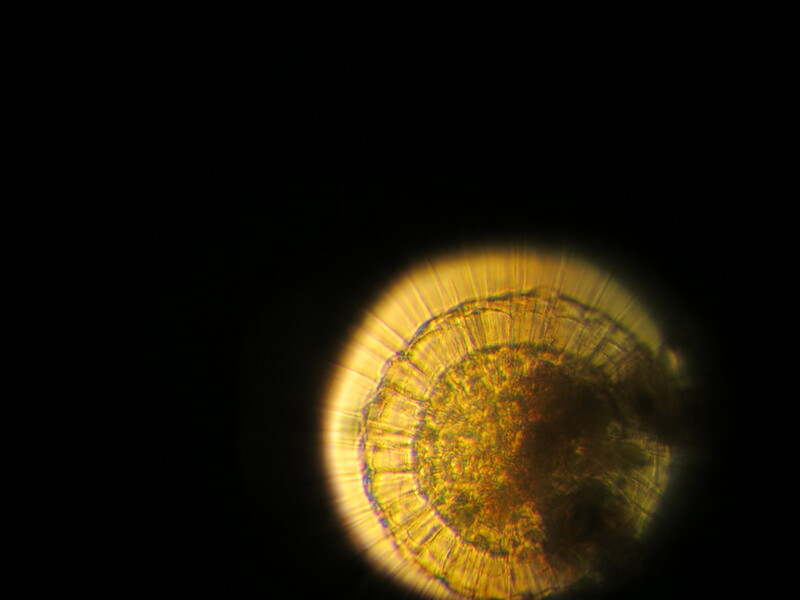 For those of you who have never looked at phytoplankton under a microscope, you most certainly have encountered them. They fill our waterways both fresh and saline (salty), are the base of our food-chain and are responsible for 50% of the worlds oxygen. phytoplankton collected at Shell Bank Bayou near LaPlace, LA and viewed through the scopes at Nicholl’s University. Thanks to Dr. Gary LaFleur and his generosity with his time and microscopes! 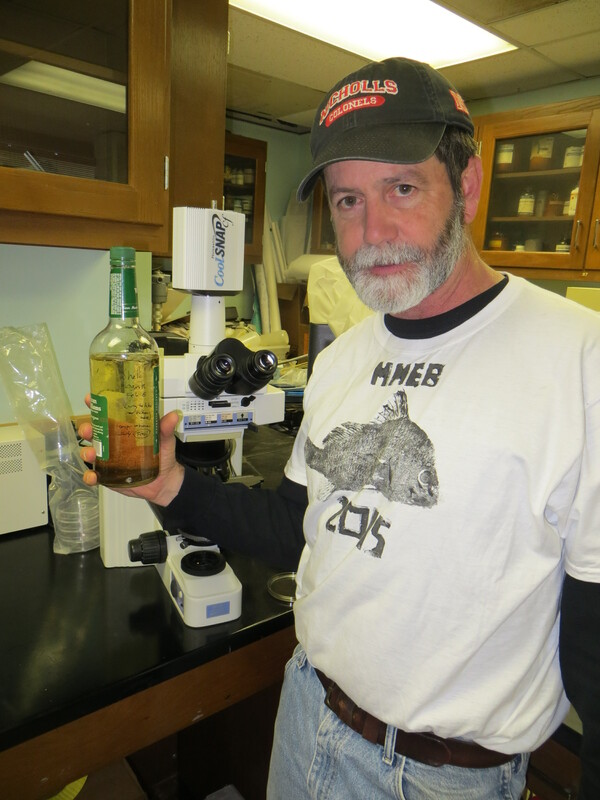 Dr. Gary LaFleur in front of the microscope at Nicholl’s University… as the sophisticated scientist that I am I figured there was nothing odd about using an old whiskey bottle for samples. Turns out when you only need a dropper of water at a time, this is serious overkill! Beyond the positive and life-sustaining qualities of phytoplankton, they are also vicious killers! Different types of harmful algae move in our waterways and stimulated by rising temperatures, and excessive nutrients – among other things, they can cause harmful algae blooms. These blooms more commonly known as ‘red tide’ are visually beautiful, covering large areas in the ocean but result in massive fish kills, and neuro toxins in humans that ingest contaminated sea food. 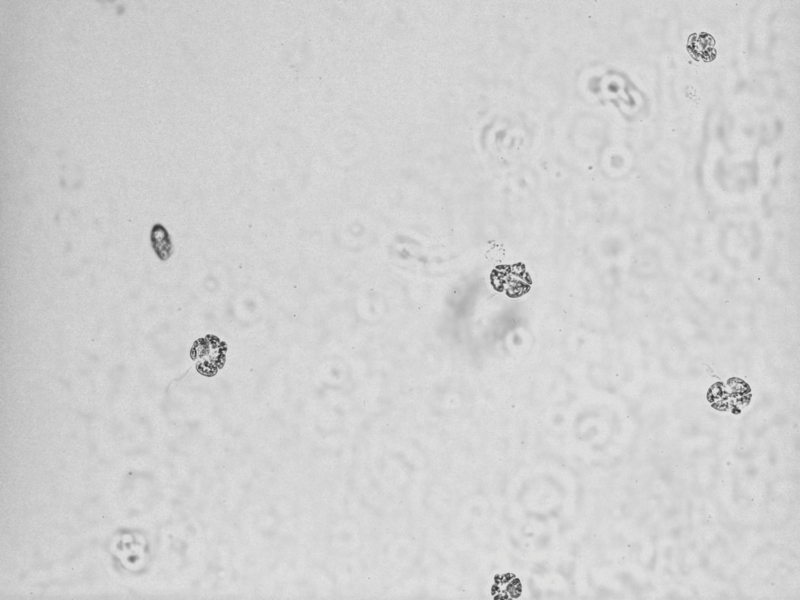 Karenia Brevis culture, harmful algae found in the Gulf of Mexico. Our project focuses on the local beasties in our waterways. We are focusing largely on the extremely understudied fresh waters that surround us. 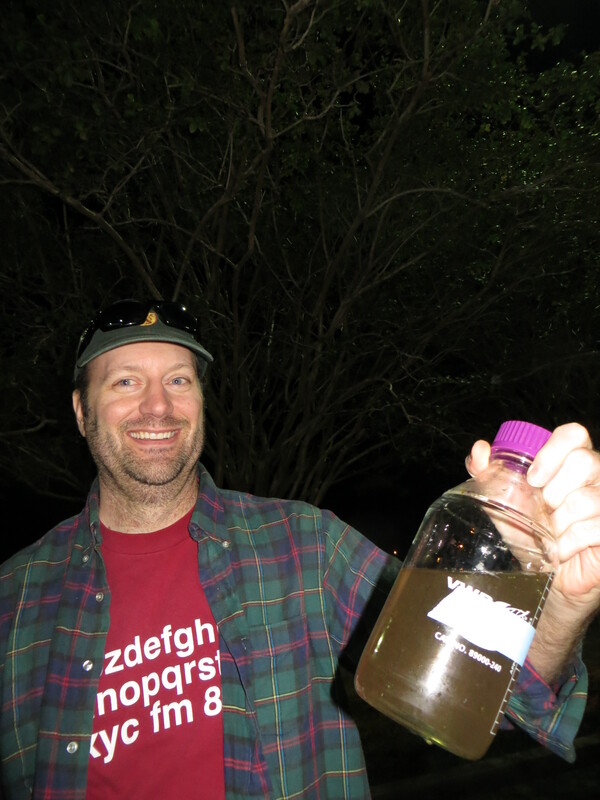 So far we have collected water samples from Shell Bank Bayou, Bayou Labranche, Jean Laffite, and Marrero, LA! Each one has amazingly different life forms! Its like watching a si-fi movie unfold before you with whirling flagella (the appendages that dinoflagelattes use to move), and undulating cilia (another hair-like apparatus for movement). To get to the root of these words Cilia is Latin for Eyelash, (Greek δῖνος dinos “whirling” and Latin flagellum “whip, scourge”). Dinoflagellates are also placed in the Fire Plant Division! 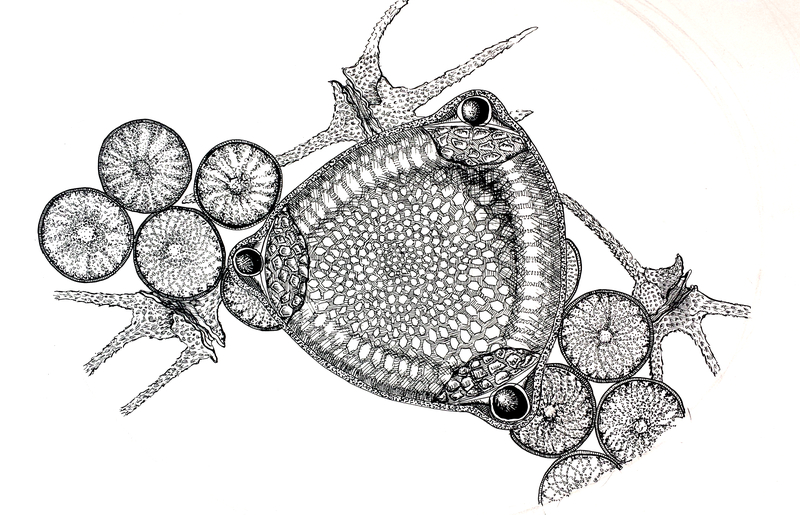 These etymologys could not be more accurate in describing the sheer wonder of watching these Eukaryote in action! As I observe them spiral and ricochet around the slide operating at 40,000 micrometers, way smaller than the prick of a needle, I realize how little I know about what sustains life on the plant. -Illuminated Phytoplankton Forms as Light Sculptures!!!! -Silkscreens of phytoplankton that are black light reflective to demonstrate concentrations of chlorophyll!! -more revelations about how sweet science is! -links to sites that inspire us!